Master Diploma in Architecture Design training course is a Building Information Modeling (BIM) solution for Civil , Architecture engineers. It provides an integrated design, analysis, and documentation tool to support building systems projects from concept through construction. Create 2d drawings with using blocks, layers. Create professional templates with attributes. Create Isometric views of any object. Create any Industrial drawing with professional quality. Create 3d solid models of any object. Create basic animation using camera. Who Should Be Attend This Course? Lectures & demos from by expert faculties. Focus on latest technologies, tools & industry practice. Projects and assignments for student's evaluation. Great faculty. Teach according to the students speed. Good experience with well understood syllabus. 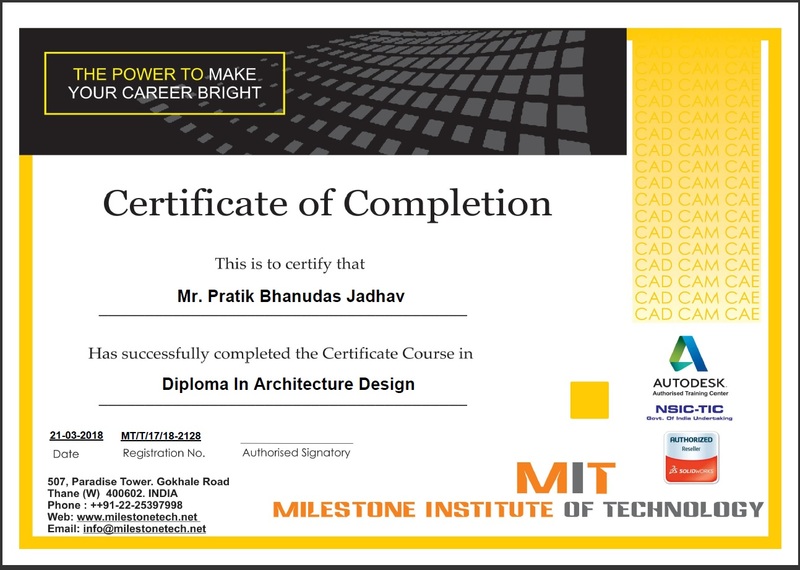 I was the student of milestone , and I have a great experience to learn autocad and Stadd Pro, with this institute. And the staff of institute is very friendly and helpful. It was amazing experience.It is the best institute for designing.good explain teaching concept and hardworking. My experience was very good...Teaching and non teaching staff is too cooperative....Teaching is very good in this institute.